After the long anticipated wait, Jack Eichel didn't disappoint in his season opener, scoring the Buffalo Sabres' first goal of the 2015-16 season. 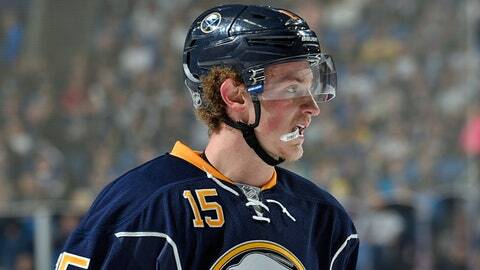 It didn’t take long for Jack Eichel to make his mark on the NHL. In a little over nine minutes into the third period, Eichel and the Buffalo Sabres found themselves on the power play. After a brief scrum behind Ottawa’s net, the puck was coughed out to Sabres forward Marcus Foligno. Foligno flung the puck across the goal mouth to the waiting Eichel, who settled the puck and snapped it into the top left corner above Senators goalie Craig Anderson. The goal made the 18-year-old Eichel the youngest Sabre to ever score in a season opener. First Niagra Center erupted. It was the only goal of the night for the Sabres in the 3-1 loss. Eichel finished the night with one goal on three shots. He co-led Sabres forwards with 21:58 minutes of ice time. He was also named the game’s second star.